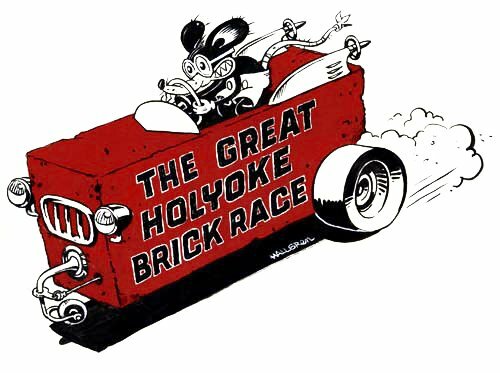 You are invited to build a brick racecar for the 5th annual Great Holyoke BrickRace to be held Saturday, June 6th, 2015 (rain date Saturday, June 13). This will be the 5th annual Holyoke Brick Race sponsored by Paper City Studios in downtown Holyoke. We believe that our “Brick Race” idea is the first of its kind anywhere in the country, and certainly it’s the first brick race ever to take place in the fine city of Holyoke, Massachusetts.The purpose of the event is to bring together the diverse community of Holyoke and surrounding towns for a day of fun, excitement and creativity for all to enjoy. We want to have as many brickracecars as can be created to kick off our 5th event, and we’d like to invite you to participate by building your own brick racer. As the name implies, a “Brick Race” involves designing and building a brick racecar that is cleverly mounted on wheels and raced down an inclined track using only gravity to cross the finish line. Our Brick Race will emphasize creativity and the sculptural quality of the racecars as well as making the fastest machine to cross the finish line first. There will be a show of all racecar entrants featured during the Spring Paper City Studios art exhibition and open studios event. 1.We invite all interested people, of any age and background – artists, students, teachers,mechanics, car buffs, tinkerers, inventors, Library of Congress archivists and compulsive contest enterers, etc. – all are welcome. 2.You may enter as an individual or as part of a group with any number of participants to make one racecar. 3.Entrants do not have to be residents of Holyoke, Massachusetts to participate in the competition, and we will accept entries from contestants worldwide including Framingham, Fargo, Fairbanks, Faskrudsfjordur (Iceland) and anywhere else – build a brick racecar and you’re in!